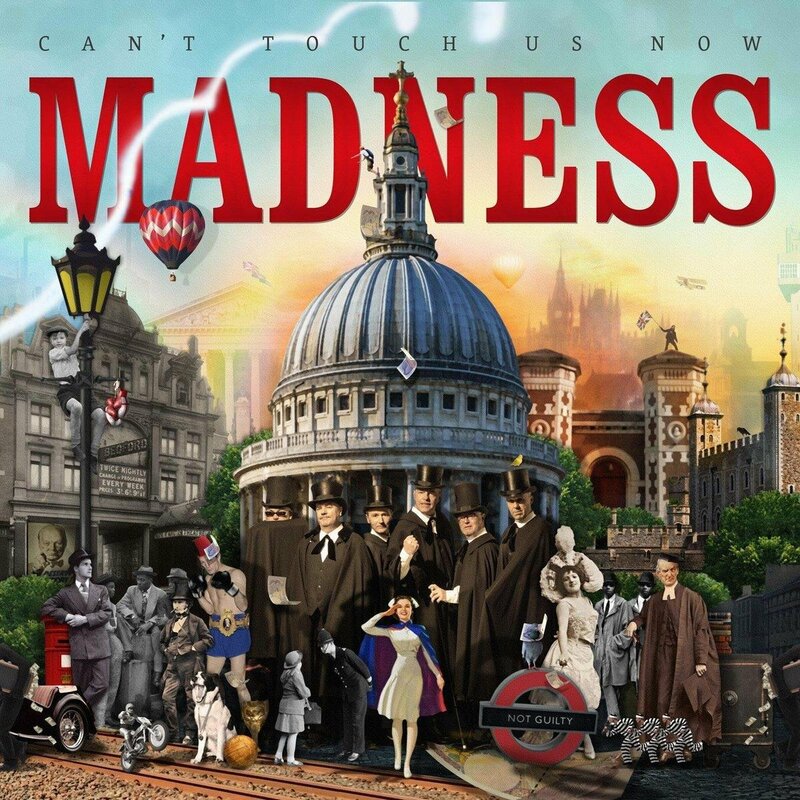 Discussions Magazine Music Blog: MADNESS/Can't Touch Us Now: The DiscussionsMag Review! MADNESS/Can't Touch Us Now: The DiscussionsMag Review! We all grow up. Some of us try to live in the past while others are happier living in the here-and-now. Our favorite artists have it far more difficult, though. They grow older and move forward, maturing like the rest of us, yet they have fans that prefer them to stay exactly the same as they were when they first started having hits. British sextet Madness has certainly had their fair share of dealings with these types of expectations from their audience. The young adults that recorded their first two albums in ’79 and ’80 – ONE STEP BEYOND and ABSOLUTELY - began to mature by the mid-‘80s and as soon as that happened, the band’s sound evolved. Their 7 and RISE AND FALL albums signaled their new-found confidence and each of them contained some big hits (most notably, “Our House”), but their audience wanted the band to remain the Ska-influenced nutty boys of old while the band just wanted to experiment and expand upon their sound. They were still selling a lot of records six years into their career but nobody seemed to really accept that the band that recorded “Yesterday’s Men” (a fab single in 1985) was the same gang that gave them “House Of Fun,” “Baggy Trousers,” and “One Step Beyond” just a handful of years before. By 1986, Madness called it quits. Each member had personally outgrown the ‘image’ that people had of the band and they needed to shake those shackles before people could take them seriously… Thankfully, they reunited for live shows in the early ‘90s and have remained together ever since (although there have been solo and side projects released since they’ve been back). Not as prolific as they once were, a studio album from Madness is definitely cause for celebration. Incredibly, the same six man line-up that recorded ONE STEP BEYOND in 1979 is the same line-up on their latest album, CAN’T TOUCH US NOW. That, in itself, is pretty damn impressive. This is only their fourth all-original album since WONDERFUL - their first studio ‘reunion’ album in 1999 - and their second since the critically acclaimed THE LIBERTY OF NORTON FOLGATE (2009). Like RISE & FALL and NORTON FOLGATE, CAN’T TOUCH US NOW finds the band taking off their rose-colored glasses and revealing the shady underbelly of London (and British life in general). From religion and politics to lost souls in turmoil, CTUN is a trip through the darker side of jaunty. This is a raw look at the real world by middle aged men who still know how to easily craft Pop gems that ‘feel’ like classic Madness songs but reveal different layers with each listen. Lee “El Thommo” Thompson’s sax still blurts and swings; Chris “Chrissy Boy” Foreman’s guitar still twangs and stings; Mike “Monsieur Barso” Barson’s keyboard work is so highly under-rated; Daniel “Woody” Woodgate and Mark “Bedders” Bedford are still one of the most creative rhythm sections in Pop/Rock; and Graham “Suggs” McPherson remains the ultimate front-man – you’ll always get an equal mix of tongue-in-cheek and heart-on-sleeve. “Mr. Apples” is a worthy first single but the real meat in CTUN reveals itself over repeated spins. “Good Times,” “(Don’t Let Them) Catch You Crying,” “You Are My Everything,” and the title track are the ones that hit you first, slowly giving way to a host of other gems like “Pam The Hawk,” “Blackbird,” and "Soul Denying". While a slow-burning album may not be welcome in a digital-on-demand world where everyone feels like they are entitled to their instant gratification right now, CTUN ultimately pays off big time for Madness fans and those who love thoughtful, well-crafted albums. If you’re looking for “Our House,” “It Must Be Love,” etc., go buy the old albums. This is an album created by six guys who gratefully acknowledge their past but prefer to move forward. For the record, I kept getting a feeling that this might be the band’s studio swan song… but I hope not! Also, read Part One of my MADNESS overview, which takes a look at a very British band from an American teenager's point of view. You can find it HERE!